The iron ore price continued to retreat on Monday on worries about a slowdown in top consumer China and as trade war fears continue to weigh on the industry. The CFR 62% Fe benchmark import price at the port of Qingdao tracked by Metal Bulletin declined to $64.45 a tonne, down 11.6% year to date, but well off lows in the $50s hit during last summer in the northern hemisphere. Notes: The OCE forecasts the FOB (free on board) Australia iron ore price, not the benchmark CFR (cost and freight) North China iron ore price. Source: Resources and Energy report June 2018, Australia’s Department of Industry. According to the latest quarterly report from Australia's Department of Industry more pain is to come. The official forecaster of the world's top exporting country sharply cut its price estimate for 2020: iron ore prices would average $51 a tonne as a result of a forecast decline in steel production and prices in China and a well-supplied seaborne market. A seasonal rebound in construction activity in China’s spring will shore up prices to average $59.40 a tonne this year according to the report. The price used by the Bureau of Resources and Energy Economics is free-on-board Australia so for comparison add between $6 – $10 for cost and freight. 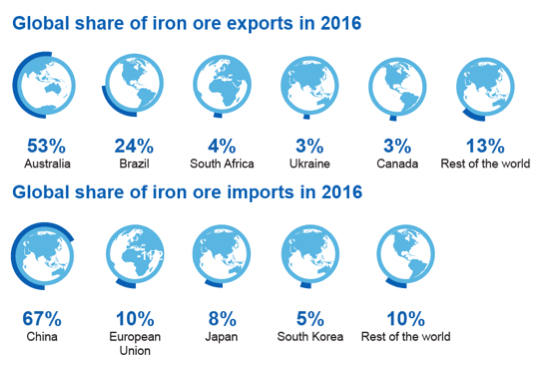 China’s overall iron ore imports is predicted to slow by 0.6% per year to 1.07 billion tonnes in 2020 (the same as actual total last year). 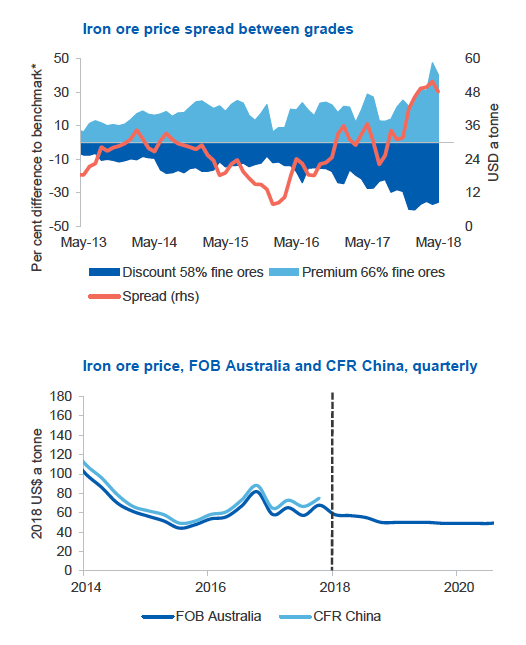 The price difference between premium and lower grade ores reached a historic high in April, driven by high steel margins which incentivise Chinese steel makers to use higher grade iron ore. The price spread is expected to narrow as steel production ramps up in China over the next few months, weighing on steel prices and profit margins and reducing incentives to purchase (more expensive) higher grade ores. Nevertheless, with an expected ongoing government push to improve air quality through increasingly stringent air pollution policies, the spread is not expected to return to historical levels. Source: Bloomberg (2018) Metal Bulletin; Department of Industry, Innovation and Science (2018) Source: Resources and Energy report June 2018, Australia’s Department of Industry. According to the report Australia’s iron ore export volumes are forecast to increase from 846 million tonnes in 2017–18, to 887 million tonnes in 2019–20, driven by the ramp up in production by Australia’s largest producers. The value of Australia’s iron ore exports is forecast to decrease from $62 billion in 2017–18 to $55 billion in 2019–20, driven by lower prices offsetting growth in export volumes. 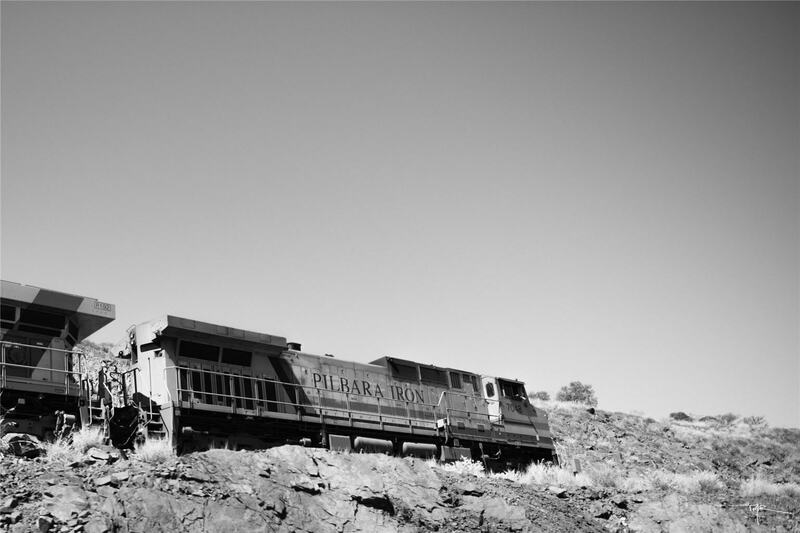 In June, BHP approved construction of a $4.2 billion iron ore mine with capacity of 80m tonnes per year while Rio Tinto announced construction of its Koodaideri iron ore mine will commence in 2019 sparking talk of a new boom time in the Pilbara region of West Australia.